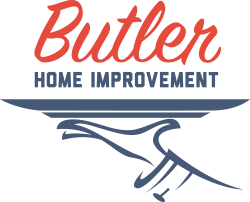 If you are looking for exceptional and stress-free service, look no further than Butler Home Improvement. Many companies claim to have great service and workmanship, so who can you trust for great work at a fair price? We believe you have the right to information to help you make a good decision, deserving to know exactly who you are working with before making your home improvement decision. We are not a high pressure sales company. We would rather be trusted advisors that know how to improve your home. When our customers talk about us, what they are saying proves we’ve earned their trust. Many companies are uncomfortable with this level of transparency, but we think customers should insist on knowing the facts before hiring anyone to work on their home. Our awards speak for themselves. Butler Home Improvement has received an A+ rating from the Better Business Bureau, the Super Service Award on Angie’s List, as well as other top rated awards and accolades. We know that the Home Improvement Industry is one of America’s Most Complained about Industries, so we have created a FREE guide for comparing contractors. If you are thinking about a home improvement project, you’ve probably heard the horror stories from the industry: slipshod workmanship, projects that drag on well past the due date, bills that come in above the quote. Sometimes jobs are not finished at all. It’s embarrassing that according to the Better Business Bureau, contractors rank as the #1 most complained about industry. Butler Home Improvement knows it is difficult for people who aren’t “insiders” in the industry to avoid a bad experience. How do really separate the good from the bad? I decided to create a Contractor Standards Guide to educate consumers about what to REALLY look for when choosing a home improvement company. Interested in this FREE Guide? Whether you use Butler Home Improvement’s services or not, you should consult each section of our guide and demand that any company you hire meet every single standard listed. If you do, you can expect to get exactly what you want out of your project. Ready to start your home improvement?